Three ropes are tied to a small metal ring. At the end of each rope three students are pulling, each trying to move the ring in their direction. If we look down from above, the forces and directions they are applying are shown in Fig. P-011. Find the net force on the ring due to the three applied forces. At what angular velocity will the stress of the rotating steel ring equal 150 MPa if its mean radius is 220 mm? The density of steel 7.85 Mg/m3. 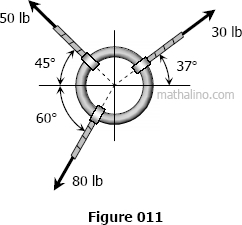 Find the limiting peripheral velocity of a rotating steel ring if the allowable stress is 20 ksi and steel weighs 490 lb/ft3. At what revolutions per minute (rpm) will the stress reach 30 ksi if the mean radius is 10 in. ?